For the past 30 years, Tom Beatson ’54 has experienced the joys of traveling on two wheels. These days, 76-year-old Tom Beatson doesn’t spend as much time in the saddle as he once did, but on Sunday mornings, he’s up before the sun, eating breakfast and preparing to leave his house shortly after sunrise, to be one of the first members of his bike club to arrive at Phoenix’s Granada Park for the weekly Breakfast Ride. 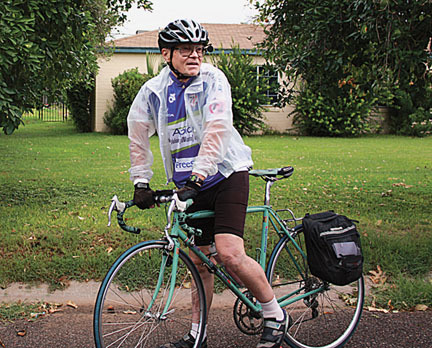 He’s been a member of the Arizona Bicycle Club (ABC) for more than 30 years—still eager to beat the heat on a jaunt through the streets of Phoenix. Beatson helps sign in 50 or 60 cyclists, who divide into smaller packs according to skill and speed levels and then set out on routes ranging from 15 to 35 miles that end at a restaurant where the riders enjoy a hearty breakfast—“another bonus of bike-riding,” says Beatson of his second breakfast. In 1978, the year he joined ABC, Beatson began to record every mile he cycled. “Keeping meticulous records kind of comes naturally to the likes of us engineers,” says the retired computer systems engineer. His typical daily tally is 20 to 30 miles, although he once cycled 115 miles over a period of about eight hours. Rides include a stretch of historic Route 66 from Seligman to Kingman in Northern Arizona and a Gila Bend tour that passes through expanses of desert that, in spring, display a floral splendor unexpected on such barren terrain. “There’s always a headwind for the ride back,” Beatson says. Last year, after 30 years of tabulating his mileage, Beatson passed an impressive milestone. Last August, leading a pack of about 50 other cyclists—all on hand to witness the momentous occasion—he pedaled past his 100,000-mile mark. Thanks to his thorough record-keeping, Beatson was well prepared for the special ride. “For several weeks I did lots of planning as I approached the 100,000-mile mark,” he says. “I figured it would be appropriate to make it happen on Sunday, Aug. 31, when I’d be riding with the club. I arranged my mileages so they’d total 99,997 by then and the club members would be riding with me as one group for the last three miles. The grey skies certainly didn’t dampen the mood. After a flurry of congratulations and handshakes, Beatson and his biking buddies rode on to The Eye Opener Restaurant, where a celebratory breakfast was held in his honor. “He’s a good person, a very good bicycle rider, who’s been with the club over many, many years. And he’s taken copious notes on what he’s done,” says club member and friend Michael Philofsky. Beatson’s feat was the more extraordinary because he is a 66-year survivor of diabetes. First diagnosed at age 10, Beatson has adhered strictly to the dietary and exercise recommendations for living with the disease and has been able to enjoy a normal life. To control his blood sugar level, Beatson uses an insulin pump, a small device worn on his body that delivers measured doses of insulin through a thin tube and fine needle inserted into an infusion site. “I can program it so I get the right amount of insulin at the right time,” says Beatson, who, when riding, wears the pump clipped to the waist of his shorts, covered by a long jersey to keep from exposing it to the sun. “It’s much easier than having to inject doses of insulin manually,” he adds. During his 100,000-mile celebration, Beatson received two awards, one from ABC members and another from the Joslin Diabetes Center in Boston, where he serves on the Board of Overseers and is a generous supporter of Type 1 diabetes research. He is a recipient of the center’s Fifty-Year Medal for living with insulin-dependent diabetes for five decades. In a way, it’s because of his illness that he came to bicycling in the first place. Involved in fundraising for the American Diabetes Association (ADA) in 1975, he was asked to help organize a biking fundraiser. “In the process of setting up the ride for the following year, I decided I’d better get myself a bike and explore the route I wanted to lay out,” says Beatson, who hadn’t ridden since childhood.